I am sure that if you have gone most anywhere in Japan in the last few weeks then you are bound to have noticed the numerous displays of bamboo and slips of paper everywhere. On each and every one of those papers are wishes about the future for so many children and sometimes adults. These are displays for Tanabata, the star festival. It is one of those holidays just like children's day or the doll's festival, where most of the celebrating is centered around children. I know my kids love the chance to write anything and put it on display (even my preteen girls). 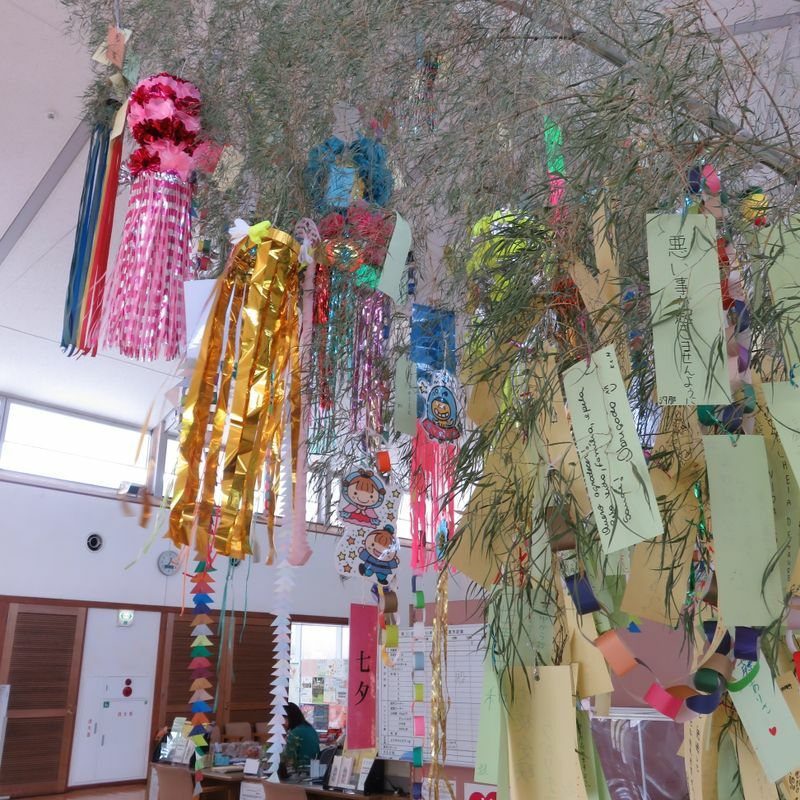 Even more fun, the schools always do something for Tanabata in this area. My first encounter with the star festival was actually at the elementary school I worked several years ago. Not knowing what was going on, I was told to head down to the gym with everyone and we were going to watch the kids perform. What I didn't realize was that it was a full concert and play. The younger kids playing on their pianicas (a mix between piano and harmonica), the middle grades on their recorders and personal instruments and the older grades performed the story of the star-crossed lovers the Tanabata festival came from. At the time, my Japanese was too poor to understand what was happening, but luckily my knowledge of Chinese folklore helped me figure out the story enough to know what I was watching. There were a few differences from the stories I had read during university from the Chinese versions, but my college education seemed to have paid off. I really got into the display of love between the two protagonists in the story. But it was, of course, the acting talent of the cows that really won me. The students must have been practicing for this event the entire semester and it showed. I had been so blown away by this perfomance that even years later I still think about it. As my son grows and gets to enjoy writing on the slips of paper, my wish is that one day he will get to enjoy practicing so hard for something that the end result shows his dedication as much as the play I watched my first year living in Japan. Until that time, he just wants an airplane. 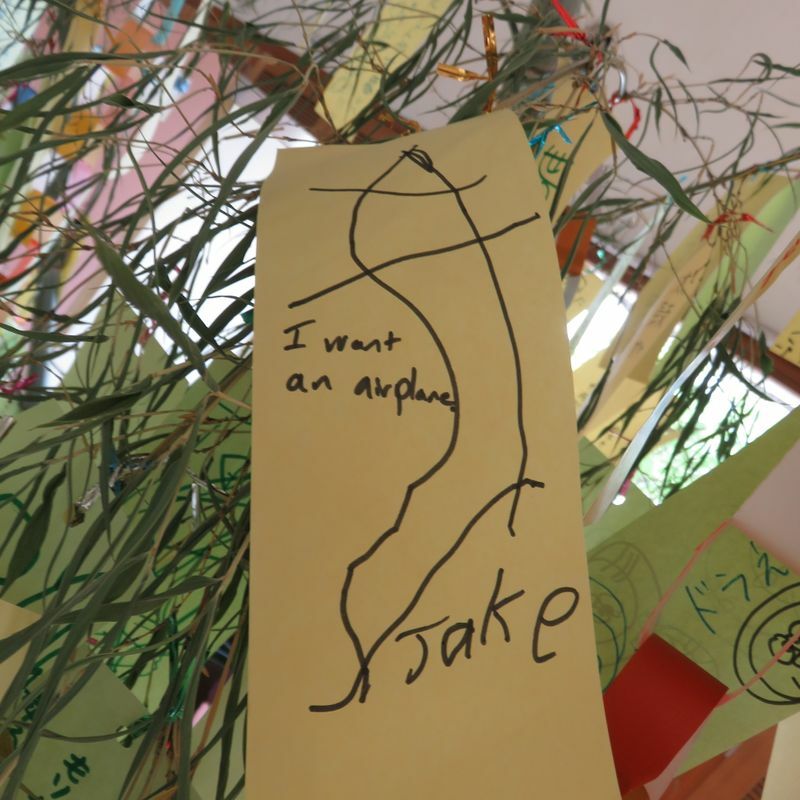 That's a pretty impressive tanabata tree! @genkidesuka I could barely get most of it in one shot. This is only half of it. @Saitama an airplane would be pretty nice!